Taking good care of your oral health can prevent cavities, tooth decay, gum disease, inflammation control, and many other oral health problems. 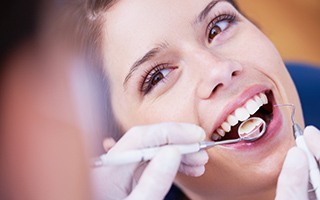 Our preventive dentistry approach includes regular teeth cleanings and educating patients on proper techniques to control dental inflammation. Inflammation in the mouth can spread to other organs in your body. There is no substitute for a good home care regimen, and combining your at-home routine with regular dental visits can make it that much easier to maintain optimal oral health. Dental exams and cleanings are two of the most important dental services we use every day, and according to our own Dr. Burdusi and Dr. Betts (as well as the American Dental Association), patients of all ages should have at least two of them each year. Some patients will need additional preventive appointments to control inflammation in their mouths. We will tailor your dental appointments based on your personal needs. Coming to see us regularly will give us a chance to catch and treat any issues you might have before they can cause major problems. Can a Nightguard Stop Teeth Grinding? This condition is also called bruxism, and it actually affects about 1 in 3 people! It can be brought on by a host of things including mal-aligned teeth, stress, injury, medications, sleep apnea, or TMJ issues. Over time, nocturnal teeth grinding can severely wear down your enamel, and eventually cause your teeth to crack and break. To help with this sneaky habit, we can offer you something called a nightguard. It is a small, custom-made mouthpiece you’ll only need to wear to bed, and it works by providing a protective (but comfortable) barrier between your teeth. For more severe problems, we will recommend Split therapy. This will consist of a custom-fitted split that will be adjusted for up to 3 months until the symptoms diminish or are eliminated. Then, we will determine what it will take to have your mouth feel great with the splint inside or out of your mouth. This may involve reshaping some teeth (occlusal adjustment) or align the teeth with Invisalign to create a functional bite. You also may need the worn enamel replaced with porcelain veneers or crowns. 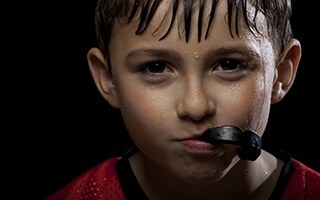 Does My Child Need a Sports Guard? Absolutely! Dental injuries account for 40% of ALL sports injuries, and that number is even higher for children! Before your child’s next game or match, make sure their smile is protected with a sports guard. Rather than giving them an uncomfortable, store-bought sports guard that may not even protect their smile, we can provide them with a custom-made one. This will not only make it much more comfortable, but it’ll also do a much better job of defending their smile as well. An oral cancer screening is essential for diagnosing and treating oral cancer early when it is easiest to treat. We will perform a thorough examination of your teeth, gums, tongue, and other soft tissues to ensure there are no lesions or suspicious-looking bumps. We will perform an oral cancer screening as part of your dental exam. Most dental care actually occurs at home with regular brushing and flossing, so it’s important that you use the right products to get the most out of your home routine. If you need help finding the products that are best for your smile, be sure to ask your hygienist or doctor at your next appointment. We can recommend exactly what you need. For those who have sensitive teeth or are prone to developing cavities, we can even provide MI Toothpaste right in our office. As you can see, we have just about everything you need to keep your smile healthy year after year. All it takes is just two appointments to have a fresh, clean smile you never have to worry about. If you have any questions for our team, or if you’re ready to schedule an appointment, please contact us today.